If you have a chance of going for Yum Cha in any Chinese restaurants, you might notice this traditional dish on their menu. The Stir-fried Rice Noodles with Beef (Beef chow fun, 乾炒牛河) is a classic Cantonese noodles. My father used to order it for us whenever we went to a Chinese restaurant, our all time favourite. I love eating it from childhood and it’s got lots of beautiful memories associated with this dish. Even after moving to Australia, I’d like to cook this dish every now and then, enjoying a cup of Chinese tea. This dish looks simple, yet involves lots of cooking skills and experiences, as the Wikipedia says, “it’s a major test for chefs in Cantonese cooking”. But I don't want to intimate you to try and cook this dish at home, it can be done nicely with some measures taken into account. Rinse beef and wrap dry with kitchen papers. Thinly slide across the grain. Mix with marinade for 15 minutes. Set aside. Heat oil in a frying pan over medium-high heat. Place beef on a single layer and fry both sides, until they are 70% cooked. (Note: Don’t need to stir the beef. The yummy meat juice inside will leak if the heat is down otherwise. This frying method helps the surface of your beef to be cooked quickly and seal the juice inside.) Set aside. Heat more oil in pan. Add onion and stir fry until translucent and fragrant. Be sure not to burn them. Add ginger and bean sprouts. When the bean sprouts are softened, push the onion and bean sprouts to the sides of pan if it’s big enough, or dish them up if your pan is too small. Increase heat to high. Toss in flat noodles and stir fry until it’s really heated up. Add seasoning. Remember to taste by yourself. Add more light soy sauce if needed, bit by bit at a time. If you find the colour of flat noodles is not dark enough, you can add more dark soy sauce if you like. Mind you that if too much dark soy sauce is added, your noodles will taste bitter. Toss back the beef, onion and bean sprouts, combine all ingredients. Add spring onion and mix. Serve hot. 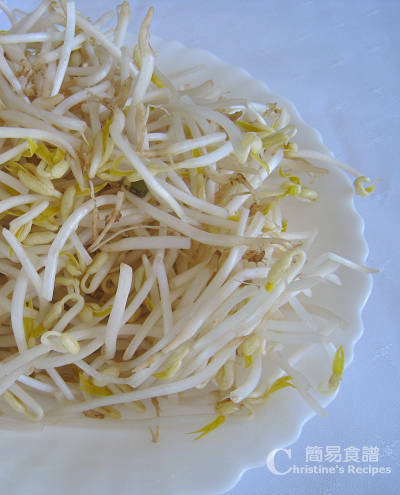 Trim the tails of bean sprouts if you have time, and get a better looking. But I have to say, it takes lots of time and effort to trim every tiny bean sprout. Some Asian stores would have trimmed bean sprouts available, but much expensive than the regular ones. Having said that, if you don’t trim them, it’s not a big deal because the whole bean sprout can be eaten and is nutritious. Just the looking is different. If you don’t want soggy and sticky fried flat noodles, don’t ever blanch them. If you do, there’s no way to turn them around. Normally, when you get a packet of flat rice noodles, they are coated with some oil. You can just drop them into a frying pan and stir fry right away. Use less oil in pan, of course. If you’re concerned with the hygiene, you might like to put the rice noodles in a drainer, then pour over boiling water to wash away the oil on the surface. Drain very well. When it comes to frying flat rice noodles, it should be soft, smooth and seasoned with the flavour of soy sauce. We all like very hot and tasty fried noodles, right? Many people would find it’s not easy to get very hot flat rice noodles in good shape. The flat rice noodles are very fragile in a certain sense. They would quickly and easily break into pieces and turn into a mess. So in a Cantonese restaurant, the heat that the chef used is very high (It’s known as "wok hei" 鑊氣) and the chef only flips the wok without stirring the noodles too much and get the dish done very quickly. But in home cooking, the temperature of our stoves is not as high as those in Chinese restaurants. Is there any way of cooking a nice plate of HOT fried flat noodles without stirring too much? Here’s a quick and simple way: Preheat them in a microwave! Carefully separate each strip of rice noodles apart before tossing them in your pan. I also love this 乾炒牛河 very much. There are many 香港茶餐厅 in Singapore now and it is a must to order when I visit these places. Will soaking in water rather than blanching be ok? Yes, I have heard the same about this dish being the test of Cantonese chefs. I like this dish but often get served greasy versions which really spoil everything. This is a big favorite with us here and I have never made it at home; thanks for the recipe and these detailed instructions! Thanks for the translated recipe! I just have another quick question - how long should we preheat the noodles in the microwave? I'm just afraid I might over cook them in the microwave....Many thanks again for the translation! Love your website and recipes! Just to warm them up in a microwave because you have to stir fry them in a pan later. Don't use too high temperature. The noodles would dry up otherwise. Normally, I use medium heat for 2 to 3 minutes. It should have a warm feel when you touch them. Most importantly, separate the noodles, and don't let them stick together before you stir fry them. I've had this dish many times..one of my favorites. Thanks for posting such a great piece. I must try this one day! Yours looks exactly like the ones I have at chinese restaurants! I remember mmy dad tried this once only it ended up all soggy, although I think that was because he added too much oil. Thanks for the recipe! I love this dish! I tried this before but the flat noodles tend to break. These rice noodles sound excellent! Wish I would have that for lunch today! This is a great dish! Thanks for the recipe. I wanted to use Chinese broccoili as well, at what point should I add them? Also, do I need to blanch them before hand? Thanks. I always like to use Chinese broccoli to fry with noodles as well. Blanch or stir fry Chinese broccoli with seasoning beforehand so that you can easily control the taste, texture and colour of it, then stir with the noodles when almost done. This is easily one of the dishes I like to order at Chinese restaurants. Tonight I made this using your recipe and it tasted just like at the restaurant! So thank you for posting and keep up the good work!! It seems that Susane's passion for food blog has an almost identical recipe that was published one day after your posting. Interesting. Why Susane's passion for food published an identical rice noodle recipe? Thanks for leaving me this message. Much appreciated. I used skirt steak, very suitable for chinese stir fry dish. I just made this tonight and it turned out amazing! I added a little more noodles and beef so I could have doubled the amount of marinade. I will do that next time. Also I added in bok choy and that pairs nicely with everything while still giving you some veg. Thanks for the recipe Christine!! Wonderful ! Bok choy goes really well with beef and noodles. It's my family's all-time favourite. I made two of your recipes - and both worked out well. Very similar to how my mom's tastes. She is 80 years old and I never learned cooking from her and she was an excellent cook. So I am thankful that you have made these recipes seem so easy to do. I am also thankful that my friend posted your website on her Facebook page, otherwise I would never have found you. Thanks, Christine! For documenting for your daughter. So glad that you loved my recipes. It's really encouraging. Sorry really confused.. Just had some rice stick noodles in my cupboard and thought I'd make that tonight,however I've read conflicting advice on cooking method, ran across this recipe and now even more confused..how should I be cooking these noodles so they don't turn to mush, or maybe no cooking. Love the idea of your recipe..please advise..and thanks in advance..hopefully this gets to you in time..
You said your rice noodles were kept in your cupboard, so I assume that they are dried. Is it right? Dried rice noodles must be blanched in boiling water first and get them softened. But I seldom use them to stir fry, often cook them in soup. 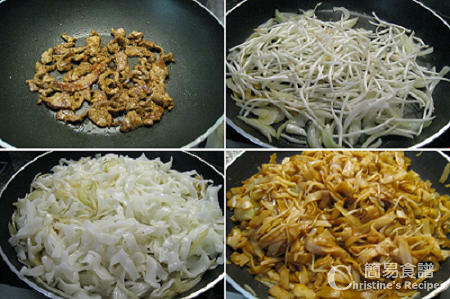 As for making this Cantonese stir-fried noodle dish, it's better to get the fresh ones, not dried ones. They look exactly the same as shown in the 2nd picture on this post. You don't need to blanch fresh rice noodles at all. Otherwise, they turn soggy and mushy. Given that you can't find any fresh noodles in your area, dried ones are the savior. Soaking is much easier to control and avoids noodles from being too mushy. Happy to know that you made a great stir-fried noodle dish. Happy cooking ! Thank you very much for sharing! This is another dish which I can cook for my family! Thanks for this fantastic recipe Christine. I've cooked it twice now and it's been delicious both times! That's wonderful ! Thanks for letting me know. 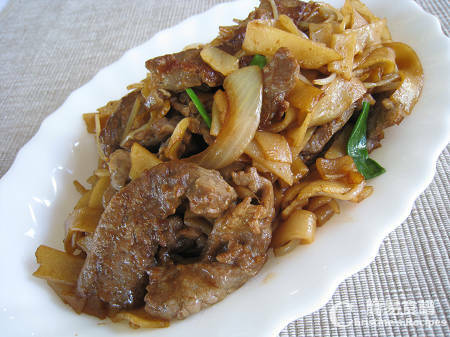 I've made beef chow fun many times using my own made-it-up recipes. My guys like it, but I have problems with the ho fun sticking to the pan, so I add more oil and the noodles end up a little too oily and soggy. Should I just let the pan get hotter and coat with oil to fix this? I have my editor's hat on -- you use the word "truculent" which means "eager to fight." I believe you mean "translucent" which means a little see-through, less opaque. Thanks for eyeing the typo. Updated the post. I came across the same problem before. Then I found a little trick to save me from this trouble. I separate the noodles by hand, then heat them in a microwave oven first. Then I don't need to stir fry the noodles very long in the pan. Using a non-sticky pan will help as well. What I have to do is to combine and mix them with other ingredients. By doing this, I can use less oil, yet the noodles won't stick to the pan very much. which part of beef is good to stir fry as i always ended up with hard beef after cooking. I often get skirt steak to stir fry. Be sure not to overcook it. Otherwise the meat will turn tough no matter which part you use.